The patent at issue, U.S. Patent No. 8,678,321 B2 (the “’321 patent”), describes a method of vertically landing a rocket booster on a floating platform after launch. SpaceX’s recent attempts to vertically land their Falcon 9 rocket booster on a floating, ocean-based platform have been widely publicized. The company cites the successful landing of a booster as a breakthrough for space travel— the ability of aerospace companies to reuse undamaged, safely landed boosters would significantly lower the cost of launches. SpaceX filed a petition for inter partes review (“IPR”) challenging the ’321 patent in August of 2014, which was prompted by the patent's granting in March of 2014. In its petition, the company stated that the “rocket science” described in the ’321 patent was “old-hat”, and was well known and widely understood by the scientific community long before the patent’s 2009 priority filing date. They also stated that the reusable launch vehicle techniques described in the patent were known by those skilled in the art as far back as the late 1990’s. SpaceX challenged 13 of the 15 claims, citing numerous references that, they argued, described elements of the claims. Accordingly, the company argued the references anticipated and/or rendered the claims obvious in light of the prior art. The references included published technical papers and patents that date back ten years or more before the filing date of the ‘321 patent. SpaceX also filed a separate petition for IPR challenging claims 14 and 15 of the ’321 patent on the ground of obviousness. The PTAB decided not to institute Space X's petition because they found the claims lacking in sufficient disclosure of structure, and thus too indefinite to conduct a claim construction analysis. Docket Alarm’s analytics tools allow users to view and track the PTAB litigation history of companies like SpaceX. You can view histograms that show procedural statistics, such as the number of IPR petitions filed, the number of petitions instituted, the number of trials instituted, written decisions, and more. 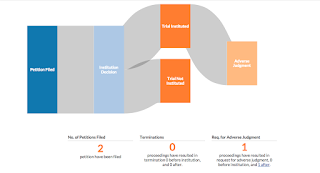 Sign up today at www.docketalarm.com to view PTAB statistics, view PTAB proceedings and petitions, research a company’s litigation history, and much more.